For other people named George Pérez, see George Pérez (disambiguation). George Pérez (/ˈpɛrɛz/; born June 9, 1954) is a retired American comic book artist and writer, whose titles include The Avengers, Teen Titans, and Wonder Woman. Writer Peter David has named Pérez his favorite artistic collaborator. 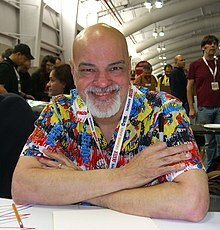 George Pérez was born in the South Bronx, New York City, on June 9, 1954, to Jorge Guzman Pérez and Luz Maria Izquierdo, who were both from Caguas, Puerto Rico, but who did not meet until approximately 1949 or 1950, after both had settled in New Jersey while searching for job opportunities. They married in October 26, 1954 and subsequently moved to New York, where Jorge worked in the meat packing industry while Luz was a homemaker. George's younger brother David was born May 28, 1955. Both brothers aspired at a young age to be artists. with George Pérez beginning to draw at the age of five. Pérez's first involvement with the professional comics industry was as artist Rich Buckler's assistant in 1973, and he made his professional debut in Marvel Comics' Astonishing Tales #25 (Aug. 1974) as penciler of an untitled two-page satire of Buckler's character Deathlok, star of that comic's main feature. Soon Pérez became a Marvel regular, penciling a run of "Sons of the Tiger", a serialized action-adventure strip published in Marvel's long-running Deadly Hands of Kung Fu magazine and authored by Bill Mantlo. He and Mantlo co-created the White Tiger (comics' first Puerto Rican superhero) a character that soon appeared in Marvel's color comics, most notably the Spider-Man titles. Pérez came to prominence with Marvel's superhero-team comic The Avengers, starting with issue #141. In the 1970s, Pérez illustrated several other Marvel titles, including Creatures on the Loose, featuring the Man-Wolf; The Inhumans; and Fantastic Four. Writer Roy Thomas and Pérez crafted a metafictional story for Fantastic Four #176 (Nov. 1976) in which the Impossible Man visited the offices of Marvel Comics and met numerous comics creators. Whilst most of Pérez' Fantastic Four issues were written by Roy Thomas or Len Wein, it would be a Fantastic Four Annual where he would have his first major collaboration with writer Marv Wolfman. Pérez drew the first part of writer Jim Shooter's "The Korvac Saga", which featured nearly every Avenger who joined the team up to that point. Shooter and Pérez introduced the character of Henry Peter Gyrich, the Avengers' liaison to the United States National Security Council in the second chapter of that same storyline. Writer David Michelinie and Pérez created the Taskmaster in The Avengers #195 (May 1980). Wonder Woman was rebooted in 1987. Writer Greg Potter spent several months working with editor Janice Race on new concepts for the character, before being joined by Pérez. Inspired by John Byrne and Frank Miller's work on refashioning Superman and Batman, Pérez came in as the plotter and penciler of Wonder Woman. The relaunch tied the character more closely to the Greek gods and jettisoned many of the extraneous elements of her history. Pérez at first worked with Potter and Len Wein on the stories, but eventually took over the full scripting chores. Later, Mindy Newell joined Pérez as co-writer for nearly a year. While not as popular as either Titans or Crisis, the series was a very successful relaunch of one of DC's flagship characters. Pérez would work on the title for five years, leaving as artist after issue #24, but remaining as writer up to issue #62, leaving in 1992. In 2001, Pérez returned to the character, co-writing a two-part story in issues #168–169 with writer/artist Phil Jimenez. Pérez drew the cover for Wonder Woman #600 (Aug. 2010) as well as some interior art. For the successful 2017 Wonder Woman feature film, director Patty Jenkins would credit Pérez's work on the title character as a major influence, on par with the work of the original creator, William Moulton Marston. Pérez returned as co-plotter/penciller of The New Teen Titans with issue #50 (Dec. 1988), the series being renamed to The New Titans. Issue #50 tells a new origin story for Wonder Girl, her link to Wonder Woman having been severed due to retcons in Crisis on Infinite Earths. Pérez remained as penciller with the book through to issue #55, 57 and 60, while only providing layouts for issues 58–59, and 61, with artist Tom Grummett finishing pencils and Bob McLeod as inker. The "A Lonely Place of Dying" storyline crossed over with the Batman title and introduced Tim Drake as the new Robin. Pérez remained as inker for the cover art to issues #62–67 and co-plotted the stories for #66–67 before departing from the Titans series once again. Pérez would be involved with Superman in various times over his career. In Action Comics #544 (June 1983), he designed Lex Luthor's trademark battlesuit. These new designs for the villain were featured as part of the licensed action figure toyline the Super Powers Collection and remain in use in today's DC Comics continuity. Pérez pencilled DC Comics Presents #61 (Sept. 1983) which featured a Superman/OMAC team-up. A few years later, Pérez inked John Byrne's pencils for the Superman/Wonder Woman story in Action Comics #600 (March 1988). He drew portions of Action Comics Annual #2 (1989) before taking over the title with issue #643 (July 1989). His work duties on Action Comics would change from writer/penciller, to co-writer/breakdowns, to providing breakdowns, with writer Roger Stern scripting stories and artists Brett Breeding and Kerry Gammill provided finishing art, while Pérez drew all covers during his run on the title, with the exception for issue #646 with interior pencils by Keith Giffen. Pérez briefly wrote Adventures of Superman, providing plots for issues #457–59 (Aug. 1989 – Oct. 1989), and inks for issue #461 (Dec. 1989). Due to an already heavy workload while doing both Wonder Woman and Superman at the same time, he left Action Comics with issue #652 (April 1990). It was during this run in 1991 that Pérez encountered problems working with DC. Pérez has stated that since the storyline's inception, which ran through the Wonder Woman comic and crossed over into others, he had trouble writing the War of the Gods storyline, mostly due to editorial problems. Pérez felt that DC was not doing enough to celebrate Wonder Woman's 50-year anniversary. To make matters worse in his eyes, DC did not place War of the Gods in newsstand distribution, which meant that the comic book could only be found in comics specialty shops. Pérez had built up a plot to marry the characters Steve Trevor and Etta Candy in his final issue. When he discovered that DC editors had decided to not only pass the Wonder Woman title's writing to William Messner-Loebs and have Messner-Loebs write the final wedding scene, Pérez quit the title and separated himself from DC for several years. In 1992, he was guest inker on Deathstroke the Terminator issues #10–11. Because of the debacles over War of the Gods and The Infinity Gauntlet, Pérez began to gain a reputation as a creator who could not finish projects as planned. Furthering that impression, he worked with independent comic book publishers Malibu Comics, drawing Break-Thru and Ultraforce (both titles were part of Malibu's Ultraverse imprint), and then working at Tekno Comix drawing I-Bots. However, despite being paid well by both publishers, he had no enthusiasm drawing the characters, and lost interest in drawing the titles. 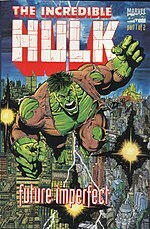 In the 1990s, Pérez left the spotlight, although he worked on several projects, including working on the Jurassic Park comic book adaptation of the movie for Topps Comics in 1993, adapted by Walt Simonson and pencilled by Gil Kane, with Pérez as inker, but most notably at Marvel Comics with Sachs and Violens and Hulk: Future Imperfect, both written by Peter David. David has named Pérez his favorite artistic collaborator, and one of the three artists whose art has mostly closely matched the visuals he conceived when writing a comic book script (the others being Leonard Kirk and Dale Keown). Pérez returned to DC Comics in October 1996 for another incarnation of the Teen Titans. Teen Titans vol. 2 was written and penciled by Dan Jurgens, with Pérez as inker for the first 15 issues of its twenty four-issue run. The series ended in September 1998. Pérez had a stint as writer of Silver Surfer vol. 2 #111–123 (December 1995 – December 1996). He would also write the crossover special Silver Surfer/Superman in 1996. Pérez finally returned to a major ongoing title for the third series of The Avengers, written by Kurt Busiek, where he remained for nearly three years, again receiving critical and fan acclaim for his polished and dynamic art. After leaving the series, he and Busiek produced the long-awaited JLA/Avengers inter-company crossover, which saw print in late 2003. A JLA/Avengers crossover was to have been published in the 1980s, but differences between DC and Marvel forced the comic to be canceled. As the artist on the story, Pérez had drawn approximately 21 pages of the original crossover, which were not published until the 2004 hardcover edition of JLA/Avengers: The Collector's Edition. Pérez has one creator-owned comic, the unfinished Crimson Plague. A science fiction story about an alien with ultra-toxic blood, the first issue was published in 1997 by the now defunct Event Comics. In June 2000, the original first issue was re-published by Gorilla Comics with additional material and pages, with a follow-up issue published in September 2000. Due to the extreme high costs of being a self publisher, which ended up being a financial burden and putting himself in major debt, Pérez ended Crimson Plague a second time and it is unknown if he intends to do anything else with the comic. George Pérez Storyteller includes artwork from the unpublished third issue of Crimson Plague. Pérez worked for CrossGen early in the new century. He penciled four issues of CrossGen Chronicles. His main project for the company was penciling Solus. Although intended to be an ongoing series, it only lasted for eight issues before it was canceled due to CrossGen's bankruptcy. In May 2006, Pérez illustrated the cover art to one of the alternative covers to the direct market release of the annual Official Overstreet Comic Book Price Guide (36th edition) featuring Wonder Woman. He was guest artist for an issue of JSA #82 (April 2006) and was cover artist from issues #82–87. He drew the first ten issues of DC's The Brave and the Bold (vol. 2, 2007–2010) with writer Mark Waid. Pérez worked on Infinite Crisis, the follow-up to Crisis on Infinite Earths, as a fill in artist. He worked on Final Crisis: Legion of 3 Worlds in 2008–2009, thus contributing to every chapter of DC's Crisis trilogy. He is also working with Marv Wolfman on a direct-to-DVD movie adaptation of the "Judas Contract" story arc from Teen Titans, which has been scheduled for release in 2017. He is a co-chairman of the board of the comic industry charity The Hero Initiative and serves on its Disbursement Committee. In 2005, an animated version of Pérez made a cameo appearance in the Teen Titans animated series episode titled "Go", which was an adaptation of The New Teen Titans #1. In the episode "For Real" André LeBlanc attacks a bank called "Bank of Pérez". In City of Heroes, a Massively Multiplayer Online RPG about superheroes, an entire zone within the game (Pérez Park) is named after him. In September 2011, DC launched a new Superman series written by Pérez, who also provided breakdowns and cover art, with interior art by Jesús Merino and Nicola Scott. Pérez remained until issue #6. The New Teen Titans: Games hardcover graphic novel was published the same month reuniting the creative team of Wolfman and Pérez. He was the inker of the new Green Arrow series, also launched in the same timeframe, over artist Dan Jurgens' pencils, reuniting the mid-1990s Teen Titans art team. Pérez and Kevin Maguire were alternating artists on a Worlds' Finest revival written by Paul Levitz. In July 2012, Pérez explained his departure from Superman as a reaction to the level of editorial oversight he experienced. This included inconsistent reasons given for rewrites of his material, the inability of editors to explain to him basic aspects of the New 52 Superman's status quo (such as whether his adoptive parents were still alive), and restrictions imposed by having to be consistent with Action Comics, which is set five years earlier than Superman, a situation complicated by the fact that Action writer Grant Morrison was not forthcoming about his plans. From September 2014 to December 2016, Pérez wrote and drew six issues of his own creation Sirens, published by BOOM! Studios. It is a science fiction miniseries dedicated to a group of women with extraordinary powers, who fight against evil across time and space. Pérez is married to Carol Flynn. He has no children. He has a brother, David, and a niece and nephew. He is diabetic, and has undergone surgery for diabetic retinopathy. In May 2017, Pérez was admitted to a hospital with chest pains and was diagnosed as having had a heart attack while travelling to New Jersey for a convention. He was subsequently released from the hospital after having a coronary stent fitted. His work (with that of Marv Wolfman and Romeo Tanghal), earned The New Teen Titans #50 a nomination for the 1985 Jack Kirby Award for Best Single Issue. His collaboration with Wolfman earned Crisis on Infinite Earths the 1985 and 1986 Jack Kirby Awards for Best Finite Series. Pérez has won several Comics Buyer's Guide Fan Awards. He won the "Favorite Artist" award in 1983 and 1985 and "Favorite Penciler" in 1987. In addition, he won the "Favorite Cover Artist" award three consecutive years 1985–1987. Crisis on Infinite Earths won the award for "Favorite Limited Series" in 1985. ^ "Master Comic Book Artist George Perez Interview"
^ a b c d "Contributors: George Pérez," The New Teen Titans Archives, Volume 1 (DC Comics, 1999). ^ a b David, Peter (March 7, 2014). "Getting by with a little help from his friends…". peterdavid.net. Reprinted from Comics Buyer's Guide #1383 (May 19, 2000). ^ Nolen-Weathington, Eric (2003). Modern Masters Volume 2: George Perez. Raleigh, North Carolina: TwoMorrows Publishing. p. 6. ISBN 1-893905-25-X. Retrieved November 24, 2011. My mom, Luz Maria Izquierdo, and my father, Jorge Pérez, were both born in Caguas, Puerto Rico, the same year but would not actually meet each other until they moved — I believe the same year, I don't know the exact year - to New Jersey...by the time they were married they had 2 children and moved to New York. ^ "Micromails: Meet the Micro-Makers: Bill Mantlo," Micronauts #7 (Marvel Comics, July 1979). ^ Shooter, Jim; Pérez, George; Buscema, Sal; Wenzel, David (2010). Avengers: The Korvac Saga. Marvel Comics. p. 240. ISBN 978-0785144700. ^ DeFalco, Tom "1980s" in Gilbert (2008), p. 197: "Created by writer David Michelinie and artist George Pérez, Taskmaster could mimic any physical skill he had ever seen." ^ a b c d O'Neill, Patrick Daniel. "Career Moves" (Pérez interview), Wizard #35 (July 1994). ^ MacDonald, Heidi D. "DC's Titanic Success," The Comics Journal #76 (October 1982), pp. 46–51. ^ Riggenberg, Steven. "An Interview with the Most Popular Artist In Comics," The Comics Journal #79 (January 1983), pp. 72–85. ^ Riggenberg, Steven and Kelvin Nueva. ""An Interview with the Most Popular Artist In Comics: George Pérez Part 2," The Comics Journal #80 (March 1983), pp. 55–68. ^ "George Pérez signs contract with DC, Takes leave of absence from Titans," The Comics Journal #92 (August 1984), p. 16. ^ Manning "1980s" in Dolan, p. 213 "Comics didn't get any bigger than this. Crisis on Infinite Earths was a landmark limited series that redefined a universe. It was a twelve-issue maxiseries starring nearly every character in DC Comics fifty-year history and written and drawn by two of the industry's biggest name creative talents – writer Marv Wolfman and artist George Pérez." ^ Manning "1980s" in Dolan, p. 221 "Batman celebrated the 400th issue of his self-titled comic with a blockbuster featuring dozens of famous comic book creators and nearly as many infamous villains. Written by Doug Moench, with an introduction by novelist Stephen King...[it was] drawn by George Pérez, Bill Sienkiewicz, Arthur Adams, Joe Kubert, Brian Bolland, and others." ^ Manning "1980s" in Dolan, p. 220: "In an effort to organize the status quo of the DC Universe after the events of the Crisis on Infinite Earths maxiseries, artist George Pérez and writer Marv Wolfman collaborated on a two-part prestige-format history of the DCU." ^ a b Appelcline, Shannon (2011). Designers & Dragons. Swindon, United Kingdom: Mongoose Publishing. ISBN 978-1-907702-58-7. ^ Gold, Alan (February 1986), "Wonder Words", Wonder Woman (letter column)|format= requires |url= (help) (329), [Alan Gold will] be turning over the editorial reins to Janice Race... She has been working for several months already, as a matter of fact, with a bright new writer named Greg Potter . ^ Pérez, George (February 1987), "The Wonder of It All", Wonder Woman (1), It was the fall of 1985... I walked into editor Janice Race's office to find out about the fate of Diana Prince. I was curious to learn who was going to draw her. Superman had [John] Byrne and [Jerry] Ordway, Batman had [Frank] Miller and [Alan] Davis (and later [David] Mazzucchelli). Wonder Woman had... No one. A writer, Greg Potter, had been selected but no established artist wanted to handle the new series. After exhaustive searches, it seemed Wonder Woman would have to be assigned to an unknown... I thought of John Byrne and Superman. What a giant coup for DC. A top talent and fan-fave on their premier character... "Janice" I heard myself say "What if I took on Wonder Woman for the first six months — just to get her out of the starting gate?" ^ Manning "1980s" in Dolan, p. 227: "With the help of Pérez's meticulous pencils, as well as his guidance as co-plotter, Wonder Woman was thrust further into the realm of Greek mythology than she'd ever been before." ^ Daniels, Les (1995). DC Comics Sixty Years of the World's Favorite Comic Book Heroes. New York, New York: Bulfinch Press. pp. 194–95. .
^ Wonder Woman (1–2), February–March 1987 . ^ Wonder Woman (3–16), April 1987 – May 1988 . ^ Wonder Woman (36–46), November 1989 – September 1990 . ^ Mangels, Andy (January 1, 1989). "Triple Threat: The George Pérez Interview". Amazing Heroes. Fantagraphics Books (156): 30. Wonder Woman's sales are some of the best the Amazing Amazon has ever experienced, and the book is a critical and popular success with its weaving of Greek mythology into a feminist and humanistic atmosphere. ^ Welch, Alex. "Wonder Woman Director Reveals Comic Book Influences". Screen Rant. Retrieved 7 June 2017. ^ Manning "1980s" in Dolan, p. 241: "With the pencils of [George] Pérez, Jim Aparo, and Tom Grummett, [Marv] Wolfman concocted the five-issue 'A Lonely Place of Dying'... In it, Tim Drake... earned his place as the new Robin." ^ a b c O'Neil, Patrick Daniel David Anthony Kraft's Comics Interview #104 (Winter 1991) Archived 2009-04-16 at the Wayback Machine pp. 21–35. Cover title: "Pérez Quits DC!" ^ Manning, Matthew K. "1990s" in Gilbert (2008), p. 254: "Written by Jim Starlin, and with pencils by George Pérez and Ron Lim, The Infinity Gauntlet was born." ^ David, Peter (August 26, 2003). "Any Questions?". PeterDavid.net. Archived from the original on March 12, 2016. Retrieved September 10, 2009. ^ Manning "1990s" in Gilbert (2008), p. 289: "At the top of [Marvel's] short list of dream artists for the Heroes Return project was George Pérez...But when asked to both write and draw the title, Pérez declined the invitation, stating he would rather just pencil the book...He did, however, suggest a writer that he wanted to work with — Kurt Busiek." ^ Cowsill, Alan "2000s" in Dolan, p. 311 "[JLA/Avengers] was an event that...proved to be one of the biggest and best of the DC and Marvel crossovers, incorporating many of the two companies' greatest heroes and villains." ^ Kimball, Kirk (n.d.). "Unpublished JLAvengers by George Pérez!". Dial B for Blog #38 (June). Archived from the original on April 9, 2016. ^ Dean, Michael (June 8, 2001). "The Case of the Disappearing Gorilla: The Banana Trust Explains How Not to Start a Comics Line". The Comics Journal #234. Fantagraphics Books. Archived from the original on March 4, 2012. Retrieved March 4, 2012. ^ Cowsill "2000s" in Dolan, p. 329 "Writer Mark Waid and artist George Pérez teamed up to relaunch one of DC's best-loved titles, The Brave and the Bold." ^ Beedle, Tim (July 22, 2016). "Teen Titans: The Judas Contract is Getting an Animated Movie". DC Comics. Archived from the original on September 23, 2016. It’s long been discussed, but it’s now officially confirmed. Teen Titans: The Judas Contract, the popular New Teen Titans storyline by Marv Wolfman and George Pérez, will be adapted into a feature length animated film in 2017. ^ "Guests of Honor," New York Comic-Con #4 program booklet (Reed Exhibitions, 2009), p. 12. ^ Hyde, David (June 10, 2011). "History Happens Now". DC Comics. Archived from the original on October 31, 2014. ^ Wolfman, Marv; Pérez, George (2011). New Teen Titans: Games. DC Comics. ISBN 1-4012-3322-8. ^ "The New Teen Titans: Games". DC Comics. September 21, 2011. Archived from the original on March 11, 2016. ^ McMillan, Graeme (July 26, 2012). "George Pérez Explains His 'Frustrating' Superman Experience In The New 52". ComicsAlliance. Archived from the original on May 1, 2015. ^ McCabe, Joseph (September 30, 2014). "Exclusive: Comic Book Icon George Pérez Introduces Us to His Sirens". The Nerdist Podcast. Archived from the original on July 15, 2017. Perez’s latest book, Sirens (published by Boom! Studios), which he writes as well as draws, is also his own creation, inspired, as he reveals in the following interview, by many of the women in his life. ^ Arrant, Chris (May 12, 2017). "Update: George Pérez Cancels 2017 Con Appearances to Focus on Health". Newsarama. Archived from the original on August 5, 2017. ^ "Eagle Awards 1979". Eagle Awards. Archived from the original on April 4, 2012. ^ "Eagle Awards Previous Winners 1980". Eagle Awards. 1980. Archived from the original on October 23, 2013. Retrieved November 3, 2013. ^ "Eagle Awards Previous Winners 1986". Eagle Awards. 1986. Archived from the original on October 23, 2013. Retrieved October 23, 2013. ^ "Inkpot Award". Comic-Con International. 2016. Archived from the original on June 11, 2016. ^ "1985 Jack Kirby Awards". Hahn Library Comic Book Awards Almanac. Archived from the original on March 4, 2012. ^ "Eisner Awards Past Recipients 1980s (including Kirby Awards)". Comic-Con International. 2016. Archived from the original on June 16, 2016. ^ Lawrence, Christopher (2006). George Pérez Storyteller. Dynamite Entertainment. pp. 192–203. ISBN 1-933305-15-0. Wikimedia Commons has media related to George Pérez. "An Interview With George Perez". 5 (3). "Coville's Clubhouse", The Collector Times. June 2000. Archived from the original on January 20, 2002.